Have you ever heard about Cheeseburger Dumplings? We bet you did! If you didn’t – cheeseburger dumplings are the mix of two cultures eastern for dumplings and western for cheeseburger. 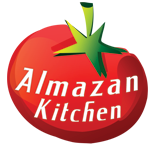 This dish will blow your mind by itself, yet it was cooked in the way of AlmazanKitchen™ under very unusual tomato sauce inside our special shelter – Balkan style cantina! Mix 1 hand of flour, with ½ hand of water and 1 tsp. of salt. Form a ball and leave to rest. Grind cinnamon stick, few bird chilies, few cloves, 3 allspice balls, 4-5 pieces of crystal sugar in the mortar using pestle. Pour in 1 cup of tomato juice. Mix well! Preheat the pan, transfer everything from the mortar to the pan. Do not forget to stir! Mix ½ tbsp. of starch with water. Pour mixed starch into the pan, slow cook until rich consistency. Do not forget to stir! Put 500g of beef mince into the mortar. S&P it well. Mix and knead mince well! Slice 100g of butter in cheese. Make a small patties with butter in cheese inside using mince. Attenuate the dough. Cut it into same 4 squares. Place small patties in each dough square. Moisten the edges and fold the dough up like we did in the video. Preheat the pan, fill it with oil for dip-frying. Dip-fry dumplings until crispy golden brown crust. Serve on the special plate with the pillow from any salad.